See where you write at night! Ideal for anyone who needs illumination when writing - pilots, flight crews, doctors, nurses, police, military... , It is best choice for your promotion Primary Competitive Advantages. 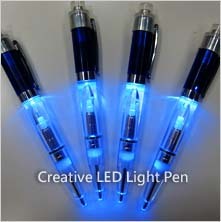 * Pen shape of flashlight with High intensity LED. * Aircraft PVC housing with push button on/off LED lighting and rotating top cap for pen retraction. * Uses one common AAA cell for up to 20 hours of illumination. * Red, yellow, orange, blue, jade and white LED colors are available. * Earth-friendly products In a variety of designs. * Exclusive development, super bright in dark, smart design for gift. 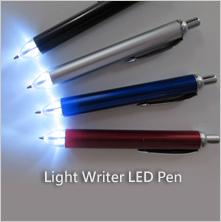 Light Writer LED Pen, LP 001 Ideal for anyone who needs illumination when writing. PVC housing with customer's designs and logo are welcome. 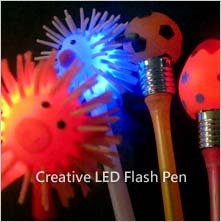 Light Writer LED Pen, LP 002 Ideal for anyone who needs illumination when writing. PVC housing with customer's designs and logo are welcome. 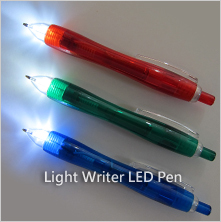 Light Writer LED Pen, LP 003 Ideal for anyone who needs illumination when writing. PVC housing with customer's designs and logo are welcome. 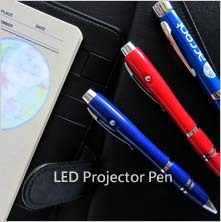 LED Projector Pen, LP 101 LED project pen light projected through a pattern or company logo. It can be used for lighting and advertisment. LED project pen light projected through a pattern or company logo. It can be used for lighting and advertisment. 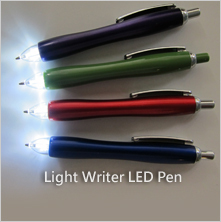 LED Flash Pen, LP 201 Exclusive OEM or ODM development. Not only ball pen function, but also can design different shape.